I would not, ordinarily, be drawn to a book about life on a military base. Stereotype me if you must, but I don’t harbor a great reverence for the armed forces. I’m not anti-military, particularly, but I do confess to rolling my eyes when I hear pundits urge yet more efforts to honor and respect the troops in a nation already awash in it. Something about You Know When The Men Are Gone was different. Maybe it was the title, maybe it was seeing that it was written by an MFA graduate of The New School who happened to be married to an Army major. Perhaps it was seeing the comparisons to Raymond Carver and Tim O’Brien, comparisons which ought not be made lightly. But from the first paragraphs of this story collection, Siobhan Fallon had my attention. In Fort Hood housing, like all army housing, you get used to hearing through the walls. You learn your neighbors’ routines: when and if they gargle and brush their teeth; how often they go to the bathroom or shower; whether they snore or cry themselves to sleep. You learn too much. And you learn to move quietly through your own small domain. 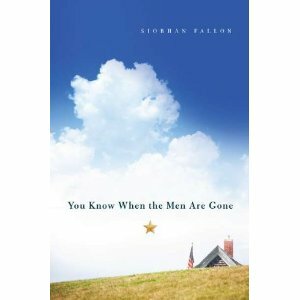 You also know when the men are gone. No more boots stomping above, no more football games turned up too high, and, best of all, no more front doors slamming before dawn as they trudge out for their early formation, sneakers on metal stairs, cars starting, shouts to the windows above to throw down their gloves on cold desert mornings. Babies still cry, telephones ring, Saturday morning cartoons screech, but without the men, there is a sense of muted silence, a sense of muted life. It goes without saying, but this obviously isn’t Dear John. Base life, marital strain, post-traumatic stress disorder. Infidelity. Nightmares brought on by seeing too much, the internal battle for your own soul. This is Fallon’s material, her inspiration. She writes with a fierce authenticity gung-ho armchair warriors will never match. Her prose is skillful, spare, lapidary. It calls no attention to itself, but instead lets you clearly see through it to what’s inside. She uses the same settings to different effects, displays a mastery of moods that many more experienced writers can’t match. From the sad and poignant opening story that gives the collection its title to the chilling, suspenseful “Leave”, Fallon demonstrates an impressive range. Fallon romanticizes nothing, neither marriage, nor parenthood, the patriotic impulse, nor even war itself. If anything, her portrayal of marriage is remarkably bleak; every marriage is near the breaking point, though not all cross it. She puts the lie to the idea of shared grief; instead of sympathy, most people can’t hide their relief that it didn’t happen to them. She does not, one hastens to say, make the military life look at all appealing, but one cannot mistake the ring of truth. You Know When The Men Are Gone will not gladden your heart. But it will impress and enlighten you. You will come away understanding, at least a little better, the life and world of a soldier in the present day. It seems likely that is just what Fallon set out to do, and she has succeeded admirably. Great review as always, Mark. Another one on my must-read list thanks to you. I have a feeling this book will hit close to home for me.